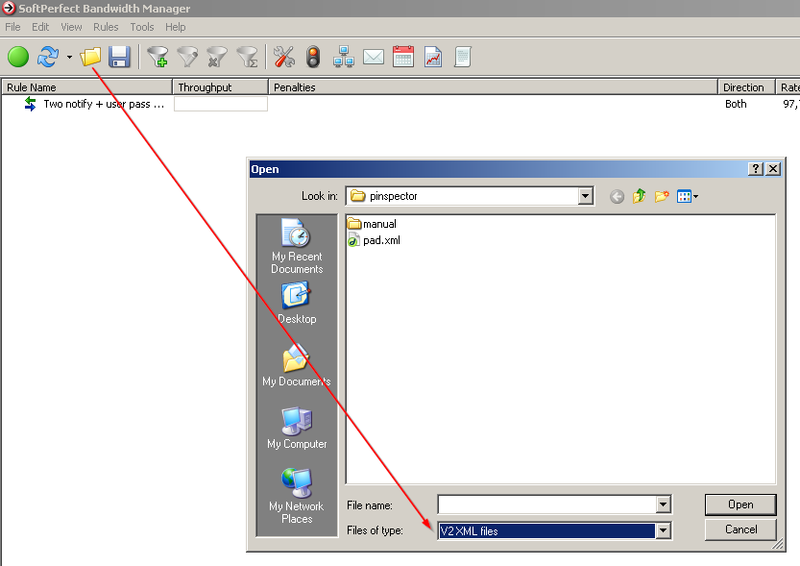 We have exciting news for BM users: we are glad to announce a brand new release. As the previous v2.9 branch was no longer suitable for further development due to certain design issues and obsolete codebase, this new release is a result of a complete redevelopment of the product with performance, stability and maintainability in mind. Full IPv6 support (previous version did not support IPv6). Native 64-bit version (previous version was still 32-bit). Support of streams in rules. Now you don't have to create a rule for every IP or MAC address as these are called streams and are created automatically. This was by far the most often requested feature. Improved performance to up to about 50 MB/s and 2-3 times lower CPU use. New Deep Packet Inspection (DPI) filter to block or prioritise certain services, including P2P. Compatibility with the new systems such as Windows Server 2012 and Windows 8. As of now, this release is a beta version. Since this is a complete redesign of the software, it may contain a few uncaught bugs. It is also NOT yet compatible with the previous version. If you would like to try this build, any previous release of BM must be uninstalled first (with a reboot). Please post any questions and feedback here. We have Version 2.9.10 and we are unable to import our rules from our current version to this new version. Do we have to create all our rules from scratch??? The new version only allows us to import .db files and not the old .xml files. I really like the old xml way as it is the fastest way for data to be transferred. The .DB format is replacing XML as a means of backing up, transferring and restoring data. Unlike XML in the past, the .DB format contains a complete set of bandwidth manager's data, including settings and usage records. By the way, even though it's a binary format, it's a standard SQLite database that can be edited if needed. We will add a way to use configuration files from BM 2.x, however this will take another few days. In the meantime, I am afraid the only way to try the new version is making rules from scratch. because when i block arp from any user to router it's cut the internet at all the other user. and i wish if u can do cache in these programe too because there is many contry use limited speed so we can save some of our many if we use that and save speed. where is the live bandwidth monitor ? It's doesn't really seem to be required as the main view has got the throughput column where you can see all rules traffic at once (and sort by it). honestly, an "old live bandwidth monitor with number" is easier to read rather than a "new throughput graph without number"
Well if there's still demand for it, we'll add it again. It's not gone forever. I would agree with that primo. I consider 0 to mean present, and 30 to mean 30 seconds ago. I've just finally downloaded and installed it on one of my desktops, I will hook up another Wi-Fi AP to it on another card to test it with some wireless devices. 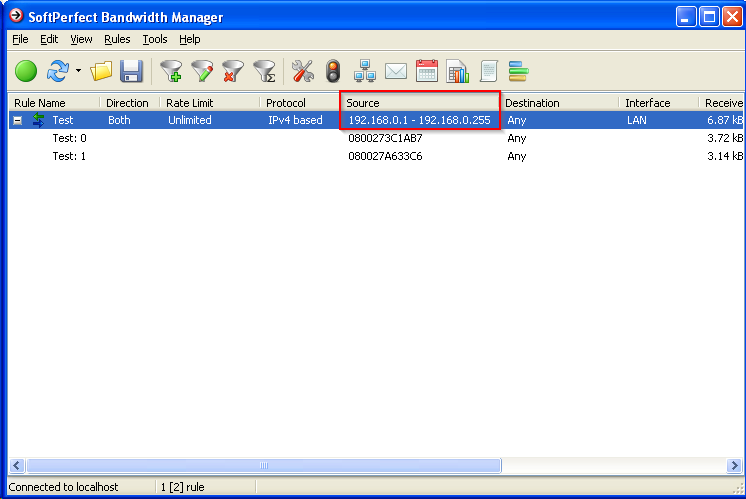 I have it set to "MAC address: Own rate limit". If I assign only a source in the own rate limit, will it automatically do it for destination as well under the one stream? edit: How long does a stream stay before it expires or is removed automatically? I'm just thinking with for example, public Wi-Fi hotspot, free access, but limited to say 400MB hourly quota before dialup speeds - based on MAC address using streams. The majority of users would be during lunch time and the streams wouldn't need to stay any longer than the quota reset interval. For somewhere like MacDonalds they would see a lot of streams build up in an hour or two but wouldn't be needed for much longer. Yes, it's automatically reversed. For example, [ANY-MAC-ADDRESS] to [AA-BB-CC-DD-EE-FF] and [AA-BB-CC-DD-EE-FF] to [ANY-MAC-ADDRESS] would be one stream. You'll see right away in the list of streams. How long does a stream stay before it expires or is removed automatically? The default setting is 6 months, it's how long the usage records are kept as well as streams. This can be configured in the global settings under Storage and can be as short as one week. Combined with a hour quota, it should work just fine in McDonalds-like scenario, where after one hour the quota is reset every hour. There isn't much overhead with keeping streams for a while, but now I think it makes sense to add a 1 day option too. I've got 49 Days trial left with this Beta 2013 I am testing and wanted to know when a Normal version is coming out to Purchase it. Thanks Nice Work So Far. 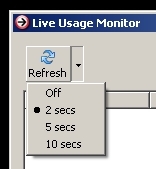 We have added the live usage monitor as requested. @ Mostafa: you can use a proxy server if that's what you mean by cache. Can't wait till then as I don't want to start all over again by going back to a older version. 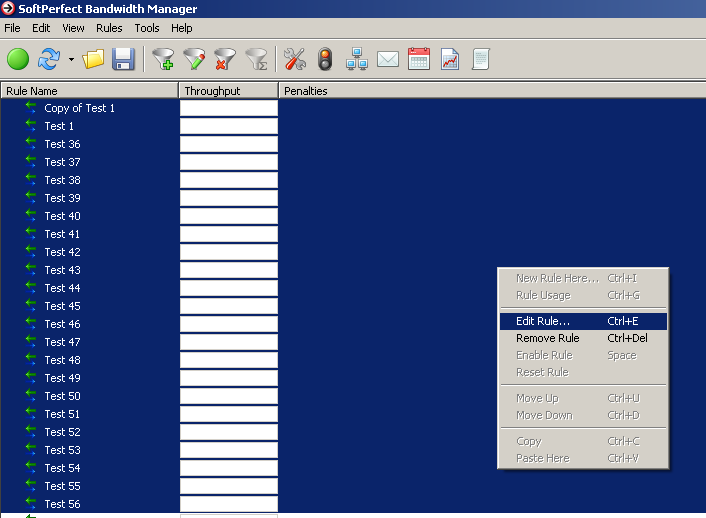 Basically if you have 100 rules and you need to set them all to your LAN or WAN interface, you would manually have to go through each rule and do it. If something like that could be added it would be great! We have added importing old XML files, you can download a fresh copy from the link in the first post. Now will this new version be able to operate, should we bridge network connections in Windows Server 2008 R2 itself rather than bridging through the bandwidth manager? Another thing I see that has been requested is the ability to forward to squid on another machine. 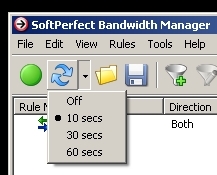 Now if we could bridge in windows instead of the Bandwidth manager I think that could work. But some might want to run squid on Linux and that is why it needs to be able to forward requests to another machine with port mapping. Hello there, and thanks for this updated version of BM! As I only need the Lite version for personal use, can you please help in activating it? Do I need a License Key? so that it does not display the 30 days countdown anymore. If I create a rule with streams that each has ipv4 - any source and destination - each MAC has it's own stream etc... I would naturally put this on the client side NIC in the BWM machine, and not the upstream router NIC. However, because of the way the stream functionality is, as I currently understand it, this means it also means all traffic coming from the BWM machine has an automatic stream too and further rule processing is stopped. So my question is, how do I excempt the BWM's own NIC MAC's from being used in an automatic stream detection for MAC's? It would be nice if you can add feature like blocking website based on domain name or website name instead of IP address only and also a feature like blocking VPN tunnel client software used by users and a feature like blocking access to website using https access (sometimes user open prohibited website using https like https:// www.Facebook.com and so on. See the FREE link at the purchase page for the license key. It has just been published. Sorry, Gavin I don't quite understand. You can just make the rule with streams that applies on the LAN side (not the WAN side), so any traffic from the BWM machine is not affected. Please describe what you'd like to achieve? We have added a way to catch standard tunneling protocols via the DPI as shown below. As to the ability to block web-sites, we will add it shortly. it would be better if you add feature to log visited websites in it. if you add this BWM will be great program in the world. Yeah sorry Andrew it sounds a bit confusing. What I was trying to do, is have one filter, any source or any destination address, with just the Advance --> Tracking mode set to "MAC Address: Own rate limit and quota for each source". The problem with this is, it doesn't apply just to automatic detected client MAC addresses, BWM is detecting it's own MAC address on the client side and creating a stream for it also. This means traffic leaving BWM to the clients all comes under one stream from the BWM MAC. I don't want that to happen, I want BWM to ignore it's own MAC address and not make it a stream. I'm not sure how to work around this. I'm probably missing something, but my logic isn't thinking very clearly today. In this case BM will correctly swap MAC addresses where necessary and won't create ones for the BM machine itself.